BestZiper is the PUP that uses misleading techniques to prevent removal. Use Reimage to locate malicious components and get rid of them faster than with uninstall instructions. A full system scan blocks virus reappearance and prevents traffic to malicious domains. If you like to browse the Internet without encountering dozens of third-party ads, try to avoid installing this adware program. It might integrate banner ads and in-text ads on websites you visit; however, it is a must to remember that these ads do not originate from websites you’re visiting. They are selected and displayed to you based on your interests, which this program finds out with the help of tracking cookies and other tracking technologies. These technologies are usually used to track words and phrases that user types into web search engines, IP addresses, browsing history, and related information. The program might also collect some personal information, including user’s name, email address and other sensitive data that one chooses to provide. Such information might be shared with partner companies. If you care about the privacy of such information, you might want to remove BestZiper from your PC to stop it from collecting such information about you. A quick way to uninstall such potentially unwanted program (PUP) is to run a full scan with Reimage or similar anti-spyware software. Researcher shows different examples of BestZiper ads. These are highly annoying and might hide dangerous links, so try to refrain yourself from clicking on them. 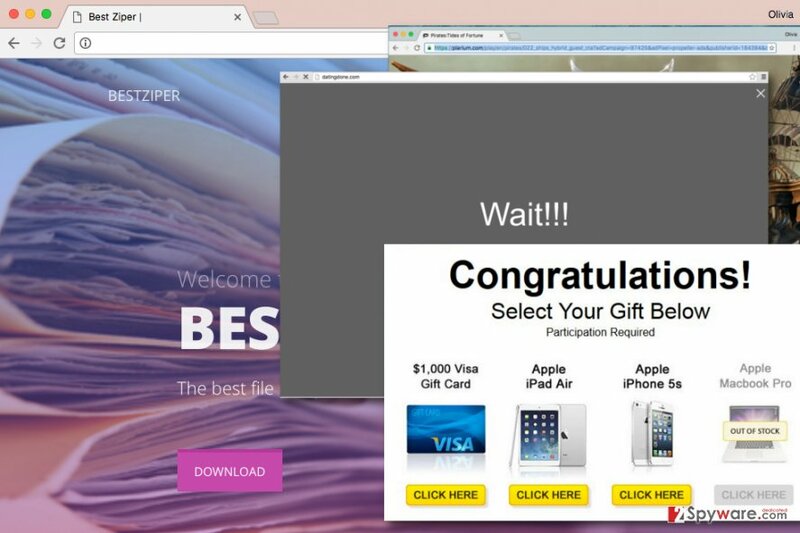 Adware programs are distributed via software bundling technique, which means you can install Best Ziper not only from its official website (bestziper(dot)com) but along with another free program. Sadly, this often happens without user’s knowledge. Software bundling helps to “group” a couple of programs together and present the additional ones in the shadow of the main one. Let’s say you have just downloaded a free media player from the Internet – which installation settings are you going to choose? If you’re thinking about Default or Standard ones, you are making a mistake already. These settings will permit installation of all extra programs bundled with the main one because the developers of it are paid to suggest users to install these additional programs along with their software. Therefore, we recommend choosing Custom or Advanced software installation settings, which will allow you to see all additional programs, browser toolbars, or search tools added to your preferred software. This way, you won’t have to waste time for BestZiper removal later on. If you’re tired of ads and system slowdowns that this adware causes, remove BestZiper virus with a help of a guide that our experts prepared. You can find it right below the article. If you have no time to actually sit down, read the instructions and browse through various computer locations to uninstall the adware, you might want to shorten BestZiper removal procedure and remove it using anti-malware program. In such case, we suggest using one of the programs listed below. To remove Best Ziper, follow guidelines provided below and try to find an in-built uninstaller of this program. If you can’t find it, uninstall other suspicious programs that draw your attention. Here, look for BestZiper or any other recently installed suspicious programs. Wait until you see Applications folder and look for BestZiper or any other suspicious programs on it. Now right click on every of such entries and select Move to Trash. When in the new window, check Delete personal settings and select Reset again to complete BestZiper removal. Once these steps are finished, BestZiper should be removed from your Microsoft Edge browser. Here, select BestZiper and other questionable plugins. Click Remove to delete these entries. Now you will see Reset Firefox to its default state message with Reset Firefox button. Click this button for several times and complete BestZiper removal. Delete Chrome extensions that weren’t installed by you. Get rid of all suspicious ones. Here, select BestZiper and other malicious plugins and select trash icon to delete these entries. Click Reset to confirm this action and complete BestZiper removal. Here, select Extensions and look for BestZiper or other suspicious entries. Click on the Uninstall button to get rid each of them. Now you will see a detailed dialog window filled with reset options. All of those options are usually checked, but you can specify which of them you want to reset. Click the Reset button to complete BestZiper removal process. ^ http://www.2-spyware.com/olivia-morelli. What is adware and how to remove it. 2-Spyware. Fighting Against Spyware. ^ Tracking Cookie Description. F-Secure. Cyber Security Solutions for your Home and Business. ^ Browser toolbars – once a blessing, now a curse. Emsisoft Blog. All About Security Online. This entry was posted on 2017-04-27 at 04:49 and is filed under Adware, Viruses. You can quickly scan the QR code with your mobile device and have BestZiper ads manual removal instructions right in your pocket. How did you remove BestZiper ads?